Imagine waking up and finding someone in your house. You’d be pretty freaked out, right? Well, take that one step farther and imagine yourself waking up to find someone parked in your house. Namely, someone that drove through the wall of your home and into your bedroom. 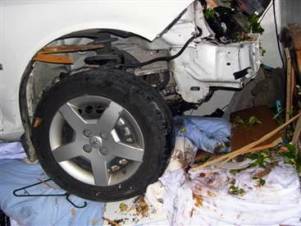 That’s the nightmare Trent Wood and Kristin Palmer experienced when drunk driver Eric Cross mistakenly drove through the front wall of the couple’s home and pinned them to their bed, beneath his car, for more than an hour. Amazingly, neither person was hurt. They got a few scrapes and burns, but considering that they had a car parked on top of them, it’s a miracle that they didn’t suffer all sorts of horrific injuries. At the very least they should’ve broken some bones, but no. They’re both completely fine, aside from a little shaken up. That’s one of the most amazing survival stories I’ve heard since the tsunami surfers!